SOS Meals On Wheels’ primary function is to deliver nutritious, balanced meals and friendly safety checks to homebound seniors. We fight every day to keep seniors in their homes, healthy and happy, for as long as safely possible. SOS Meals on Wheels is a 501(c)3 non-profit organization that addresses the issue of senior isolation and hunger locally. Initially called Service Opportunities for Seniors, SOS was founded by a compassionate community activist named Emma Vargas in 1966 as an extension of an outreach program to seniors in an old church facility in Hayward. The program expanded steadily over the years, adopted the Meals on Wheels moniker and model, and in 2013 SOS Meals on Wheels designed and completed a new commercial kitchen in San Leandro, dramatically increasing our ability to meet the needs of seniors in the community. SOS Meals on Wheels currently delivers 1,600 meals daily. Our mission as an organization is to promote nutritional health, decrease the possibility of premature institutionalization, and foster the independence and dignity of homebound seniors in Central Alameda County and the City of Oakland. We are part of a network of 5,000+ independently run local meals on wheels programs across the United States. In addition to the 1,200 we prepare and deliver to seniors in our service area, we prepare an additional 400 meals , including specialty diets, for seniors in Fremont, Newark, or Union City through a partnership with LIFE ElderCare. What began as a small outreach program in an old church facility in Hayward has grown steadily over a half century. It is projected that the number of seniors living in poverty in Alameda County will continue to rise at an unprecedented rate. We intend to keep fighting on behalf of vulnerable seniors for the next half century and beyond! Volunteers are our lifeblood. 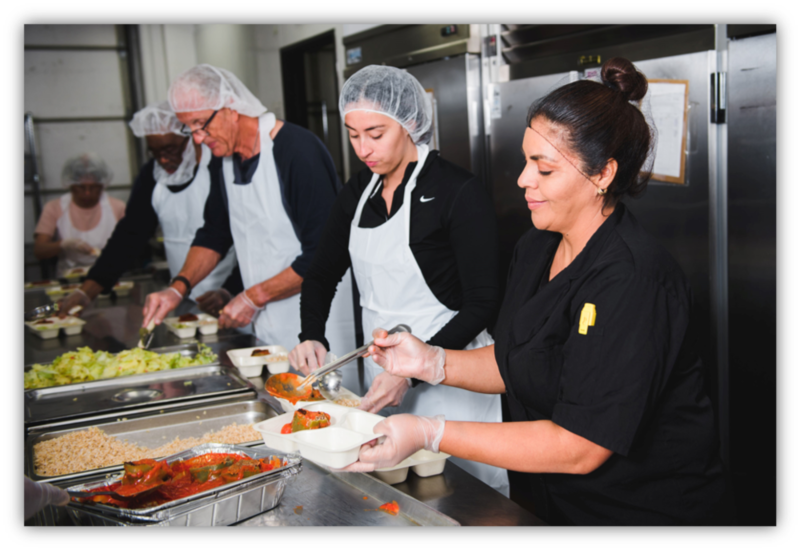 In FY 2016-2017, volunteers drivers committed 6000+ hours to delivering meals, kitchen volunteers gave 3,000+ hours to preparing nutritious meals, and many others showed their commitment to our mission by helping in other ways. Our nutritionally balanced meals are available for delivery Monday through Friday, mornings (10am-1pm) and afternoons (1pm-4pm). Meals are delivered by volunteer and staff drivers who have undergone thorough background checks and rigorous training. Individuals may be referred to our program by family, neighbors, friends or clinical or social work professionals. Individuals may also contact us directly. The initial intake screening is done over the phone. A private interview with the eligible senior and/or family is arranged shortly after the initiation of meal service to ascertain the unique needs of the individual. Meals on Wheels relies on contributions from seniors to help fund the program. We suggest a donation of $3.50 per meal. However, clients may give what they can afford and no senior is denied service due to an inability to donate. To inquire about meal delivery service in Castro Valley, Hayward, San Leandro, or San Lorenzo, call Deborah Kuehner at 510-582-1263, ext. 114. And for meal delivery service in Oakland, call Kathy Gonzales at 510-582-1263, ext. 101.
do not receive help from a reliable caregiver. Our highest priority is to serve frail seniors who most urgently need our assistance. Our 3,000 square foot custom designed commercial kitchen opened in 2013. It is set up to produce up to 2,000 meals in a single shift and significantly increased our capacity to meet the needs of our senior communities. SOS Meals on Wheels proudly serves seniors residing in Castro Valley, Hayward, Oakland, San Leandro and San Lorenzo. Our menu is developed by a Registered Dietician and approved by a Senior Nutritionist from the Area Agency on Aging. The menus are based on mandated nutritional requirements, available financial resources, as well as the food preferences of our meal recipients. All meals are low sodium, low fat and low cholesterol, and always include seasonal fresh produce. By all accounts, the number of seniors at risk for malnutrition and social isolation in Alameda County is rising. There are a number of ways you can help address this growing issue! Join us today on our mission to fight senior hunger and isolation in our communities. Give the gift of your time! You don’t need to make a big commitment to make a big difference. Many opportunities are available. Click here to learn more. Donations big and small from compassionate individuals in our community help keep the meals rolling. Dig deep and donate today. Every dollar counts. Many levels of sponsorship are available and many benefits too! Show the world that you or your company cares about the most vulnerable among us.